When you hear the term PTSD—or post-traumatic stress disorder—you might think of war veterans or sexual assault survivors having flashbacks or nightmares about a traumatic event they’ve lived through, which is usually how the disorder is portrayed in movies and on television. And while it’s somewhat accurate, there’s a lot more to it than that. So what is PTSD? We spoke with an expert to better understand the complicated disorder. PTSD is a mental health condition triggered by experiencing or witnessing a traumatic event. You can develop PTSD at any age, and it’s more common than you might think. According to the National Center for PTSD, about seven or eight out of every 100 people will have PTSD at some point during their lives. Additionally, around 8 million adults have PTSD in a given year. We spoke with clinical psychologist Dr. Dalia Spektor about the disorder. Dr. Spektor has a private practice in New York City and specializes in trauma, PTSD, relationship issues, and grief. She explained what PTSD is, the criteria one must meet in order to be diagnosed, and a variety of ways it can be treated. If you’re recovering from trauma and think you might be experiencing PTSD, speak with your doctor or find a therapist. There are resources that can help you—even if you aren’t comfortable talking about your experience right away. “PTSD stands for post-traumatic stress disorder. If we go by the textbook definition, the Diagnostic and Statistical Manual (DSM) classifies PTSD under trauma or stressor-related disorders. It defines a traumatic event as an event that is life-threatening, a serious injury, or a sexual violation. Essentially, it’s when your natural response to trauma lasts way longer or comes on much later than what is typical or normal. What are the signs that someone has PTSD? “There are criteria that you have to meet in order to be diagnosed with PTSD. It’s not only that you’ve been exposed to life-threatening events. You have to meet other criteria: it has to last longer than a month, and it has to interfere with your relationships and work. And it can’t be due to any other mental or medical condition, or substance abuse. You have to have at least one re-experiencing symptom. Examples of re-experiencing symptoms are intrusive memories or upsetting thoughts that are associated with the trauma; flashbacks, where you feel like you’re reliving the traumatic event; or nightmares. You also have to have at least one avoidance symptom. Avoidance symptoms include things like avoiding the place where the traumatic event happened, or certain situations or people that you associate with the trauma. Avoidance can also mean not wanting to think about what happened or not wanting to talk about what happened—basically, not wanting to deal with anything that reminds you of the traumatic event. You also have to have at least two arousal and reactivity symptoms. Arousal symptoms are those that make you feel like you’re keyed up and on edge. It’s like you’re constantly on guard; you have a difficult time unwinding. Another common arousal symptom is an exaggerated, heightened startle response—you’re jumpy. It’s normal to be jumpy if you’re watching a scary movie, for example, but it’s not really all that normal if a friend comes in to say hi or puts their arm around you, and for you to have an exaggerated jumpy response. Someone with PTSD may be jumpy in a very calm setting. Then, there are also reactivity symptoms, which refer to feeling really irritable or aggressive. People with PTSD oftentimes have problems with anger. We think about these expressions like “flying into a rage” or “lashing out”—it’s that kind of aggressive behavior. It’s usually without much provocation. It’s usually because they’re responding to something that’s triggering them. It reminds them of the trauma. Then, there’s also cognition and mood symptoms, and you have to have at least two of them. Examples of cognition symptoms include difficulty concentrating and not remembering certain aspects of the traumatic event. 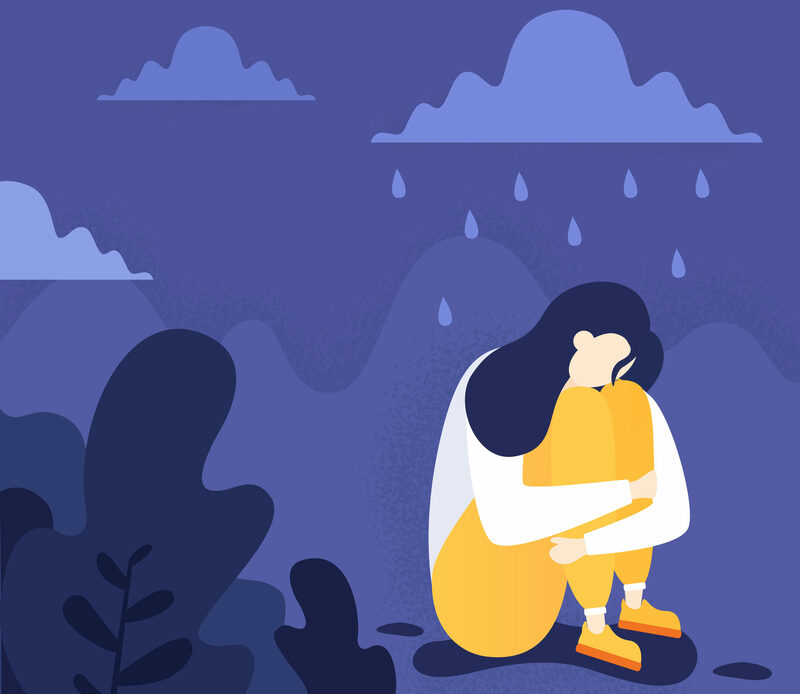 Examples of mood symptoms include feeling bad about yourself, feeling bad about others, feeling bad about the world, having an excessive amount of shame and guilt, feeling detached, feeling numb, and not being able to experience positive [emotions], like joy or happiness. What if the traumatic event is not one of those three things? Can someone still be diagnosed with PTSD? “PTSD has to be diagnosed. But I do think trauma can be really subjective. I don’t think it should be limited to those three things—a life-threatening event, a serious injury, or a sexual violation. I think bullying, for example, can be really traumatic. Even going through a divorce, or losing a loved one or a child. I do have patients coming into my office who meet the criteria for PTSD, but the traumatic event was not one of those three. But I still understand their symptoms in the context of that trauma, so I can still talk about it in the same way. What’s mildly disturbing for one person can be really traumatic for another. There is a subjective piece to it. How does PTSD affect someone’s life? How does it show itself? “It can make everything more challenging. There’s an overarching feeling that the world around you is not safe and that you’re not safe. So even the most benign activity, like walking your dog or going to the grocery store, can feel terrifying and cause you to spiral out of control. If your sleep is poor, you’re probably sleep-deprived most of the time. That alone will have a negative impact on your health and affect your quality of life. I worked with one patient who was a 9/11 survivor, and he developed road rage as a result of PTSD. So he could be driving in his car, and there’d be a traffic jam or an accident, and he’d feel totally trapped and out of control. That was the trigger. That’s when that fight-or-flight response would kick in, and he would fly into rage. Is PTSD treatable? What’s the treatment process like? “It is treatable by a trained professional like a psychologist, who has experience treating individuals with histories of trauma. There are many effective psychotherapies. Talk therapy is one of them. There are different kinds of talk therapies, but most of them emphasize a few key things, like educating the patient about the symptoms, teaching skills to help identify the triggers of the symptoms, teaching the skills to manage them, and medication—often, medications we use to treat depression and anxiety can also help in combination with therapy. What can someone do if they don’t like talking about their PTSD? “You have to understand that’s one of the avoidance symptoms of PTSD—not wanting to talk about it, which is of course understandable. You’re certainly not alone in that feeling. Most therapists are sensitive to that and will let you go at your own pace and teach you some relaxation techniques first in order to be able to tolerate the uncomfortable feelings as you begin to talk about it. But there are nonverbal treatments. If you have a difficult time verbalizing what you’ve been through, there are some types of therapies that don’t emphasize talking about it. Examples of that are certain therapies that fall under cognitive behavioral therapy. One of them is called stress inoculation therapy, which is more about learning how to relax. Are there different types or varying degrees of PTSD? “The DSM does not talk about different types of PTSD. As society changes, and as research continues, our understanding of PTSD will continue to change. The more we understand it, the more it changes. The course of PTSD looks different from person to person. Some people do recover after a few months, and others suffer for much longer. How is PTSD different from anxiety or depression? “A person with PTSD looks a lot like someone with anxiety and depression, but there are key differences. In PTSD, the trauma is the cause of the distrust. It’s the earthquake, and the symptoms are the aftershocks. One way you can think about it is a person with anxiety may engage in avoidance tactics, but it’s mainly about avoiding social embarrassment and rejection. For someone with PTSD, the avoidance is about avoiding the trigger that reminds them of the traumatic event. Individuals with PTSD and individuals with depression both tend to feel pretty bad about themselves. They tend to have a lot of guilt. But with PTSD, it’s really tied to the event surrounding the trauma. And with depression, those feelings are more pervasive. What happens if PTSD goes undiagnosed? How can someone find a therapist? Does PTSD ever go away? What can someone do if they suspect a loved one has PTSD but it hasn’t been diagnosed? “Show your support and let them know you’re there for them. You can gently offer to help them find a professional to talk to. It’s hard; you can’t force anyone to go to therapy. They have to come to it on their own and they have to be ready. You can let them know that you’re there for them. And you can say something like, ‘You don’t have to suffer.’ That brings choice into the equation and lets them know they can choose to do something about this. If you or someone you care about is struggling with trauma, here are some helpful resources to find treatment in your area. If you are a veteran, you can contact the Veterans Crisis Line at 1-800-273-8255 for assistance.